Super nice guy with so knowledgable about appliances...he came prepared for anything and fixed my 15 year old microwave/convection oven like it was brand new again! Will definitely be calling them again if any of my appliances need fixing! The service scheduling process was easy. 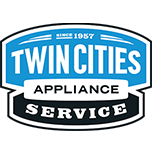 Communication from Twin Cities Appliance was very good and the technician provided service a day earlier than scheduled due to an opening in the schedule. Great first experience with this company. Very nice gentleman; nice to be able to see when they leave one job and are on their way to the next one. REFRIGERATOR KITCHENAID KRFF507EWH01 "Ref evap iced up. Damper and fan motor locked in ice. Removed evap cover and thawed evap. Inspected wiring and thermister, evap thermister in proper position and no cracks. Evap cover has crack in bottom and one tab on top broke off. Ordering evap cover, damper and evap fan with harness; ordrng 1 W11033168 (EVAP MOTOR W/ HARNESS) and 1 WPW10248595 (DAMPER) and 1 WPW10501260 (EVAP COVER)"
OVEN IKEA IGS900DS04 "Bake ignitor in upper oven failed. Installed new ignitor and tested, all ops good, both ovens lighting and heating properly; used 1 WP7432P143-60 (BAKE IGNITOR) from stock"
RANGE WHIRLPOOL WFE550S0HZ0 "Right front element coming on but not regulating, stays on high. Removed top and verified part number on element, parts lookup shows that listed as the left front. Ordering element and infinite switch; ordrng 1 W10823729 (ELEMENT) and 1 WPW10434452 (INF SWITCH)"
DISHWASHER WHIRLPOOL WDT730PAHZ0 "4-3,7-1 replace sump, run test cycle, ok; used 1 W11085683 (SUMP) from stock"
MICROWAVE IKEA IBMS1455DS00 Install cover inlet check over unit tested out good.. RANGE WHIRLPOOL KFEG500ESS3 "Cust concerned because front edge of cooktop will get too hot to touch when using large left front burner. Can take ten or fifteen minutes when using burner on high with a large pan. Lifted the top and checked burners, found left front burner was pushed down on its clips and was not at the correct distance above the baseplate, moved into proper position. Put a large pan of water on and started burner on high. Cooktop front got too hot to touch. Called WP techline, they said it is not unusual for front to get hot with a large pan on front burner, can get 70-80 degrees above ambient temp, which is too hot to touch, but that it is within tolerances. SR 7724415927. Cust still thinks it is unsafe with small children in home, will go back to store of purchase"
OVEN JENN-AIR JJW2827DS02 "Pulled unit out on dolly and disassembled. Found harness for meat probe curled back and pinched on itself. Installed new meat probe and harness and reassembled. Remounted in wall and tested, oven heating normally, ran all the way up to 350. All ops good"
REFRIGERATOR WHIRLPOOL KRMF706ESS01 "Received wrong control board, correct part ordered and box had correct part number on it but had the wrong part in the box. Reordering UI assembly to tech so i can check it to make sure its right; ordrng 1 SHIPTOTECH (DIRECT TO TECH) and 1 W10894103 (UI ASSEMBLY)"
REFRIGERATOR WHIRLPOOL KRMF706ESS01 "Installed new user interface and dispenser door assembly and cycled power to unit. All ops good, now able to reset water filter." DISHWASHER KITCHENAID KDTM404ESS3 "Replace clips and order tracks, top tracks also sticking, call when coming back; ordrng 1 W10822165 (TRACK) and 1 W10822166 (TRACK) and 1 W11259785 (TRACK) and 1 W11259786 (TRACK)"
DISHWASHER KITCHENAID KDTM404ESS3 "Replace tracks, test ok"
OVEN JENN-AIR JJW2827DS02 "Pulled unit partway out and installed new appliance manager for lower oven. Tested, still getting error code when lower oven gets to 160. Need to pull unit out and check for bad connections and/or bent or broken wires. Ordering main harness, meat jack and new locking nut to tech. Power pigtail runs down and into junction box in cabinet to left of oven, will need two techs in order to get unit out and back in again; ordrng 1 SHIPTOTECH (DIRECT TO TECH) and 1 W11132996 (HARNESS, MAIN) and 1 W11220388 (JACK, MEAT PROBE) and 1 WP9755546 (NUT, LOCKING)"
REFRIGERATOR WHIRLPOOL WRT348FMES00 "Cust has unit in garage, it is heated but was still at about 56 degrees. Took temps insid3 ref section, control set at middle temp setting and temp inside was about 42. Turned control to coldest setting and comp and fans turned on. While waiting to see how cold freezer got unit went into defrost. After defrost cycle finished cooling came back on again and freezer temp got down to 5 degrees before it turned off. All ops normal, issue is unit is in an environment that is at the very low end of ambient temperature norms for it to work. Cust will not be able to use the freezer during the cold weather months because the unit will not run enough to keep freezer cold. This unit has the temp control in the refrigerator section and as long as that section is cold enough the temp control is satisfied." MICRO/OVEN KITCHEN AID KEHC309JSS05 "Microwave giving door error code. Pulled microwave out and found both fuses bad, also found switch bad. Replaced both fuses and all three door switches. Also torsion springs in door bad, replaced torsion springs. Door now closing properly, unit heating normally; used 1 WP4452395 (MICRO SPRING), and 1 WP4452396 (MICRO SPRING) from stock"
REFRIGERATOR WHIRLPOOL WRT311FZDW00 "Freezer evap frosting up again. Put into manual defrost, still not getting voltage to heater and bimetal. Called WP techline and verified voltages. Put unit into manual defrost again and checked voltage at ADC board. Board bad, not going into defrost. Reordering new ADC board and new defeost bimetal; ordrng 1 WPW10352689 (ADAPT DEF BOARD) and 1 WPW10392132-FSP (DEF BIMETAL)"
DRYER WHIRLPOOL MDE5500AYW "Drum worn out, cust to get new machine"
OVEN JENN-AIR JJW2827DS02 "Lower oven giving f3e3 error code when unit gets up to about 160 degrees during preheat. Called WP techline because no tech sheet in computer, they said to pull unit out and check sides of unit to see if the chassis had gotten dented, and to check connections on main control board, also to check wiring harness for kinks or breaks. Could only get unit partway out because power cord is run into cabinet to left of unit but was able to see that right side of chassis looks ok. Checked all wiring connections coming to top of unit and control board, all good. Ordering appliance manager, will install and see if error comes back; ordrng 1 SHIPTOTECH (DIRECT TO TECH) and 1 W11179310 (APPLIANCE MANAGER)"
WASHER WHIRLPOOL WTW4955HW0 "Replace valve, calibrate, run test cycle, ok"
MICROWAVE WHIRLPOOL WMH53520CS6 "Had incorrect serial number, changed on order. Getting open close door error code and interior light not always working. Installed new door swi5ch interlock kit per service pointer. All ops good, heating normally; used 1 W11244490 (INTERLOCK KIT) from stock"
REFRIGERATOR WHIRLPOOL WRB322DMBB00 "Old door has cracked liner, installed new ref door. Closing and sealing properly"
REFRIGERATOR WHIRLPOOL WRT311FZDW00 "Installed new adaptive defrost board and air tower in freezer, made sure tower is sealing properly to bottomwhere it attaches to air dampers"
RANGE WHIRLPOOL WEG515S0FV0 "Unit purchased 4/19/18 and delivered 5/25/18, cust had email of receipt and showed it to me. Issue with oven not starting, cooktop working. Removed lower drawer and checked ignitor, found wiring connector to valve had come loose. Reattached and bent pin that holds connector in place back over connector to ensure it stays in place, looks like plastic pin was bent too far over and connector eventually worked its way loose. Tested bake, now lighting and heating properly"